Now Comcast has won the battle for Sky; the cabler should take a long hard look at Sky’s Now TV. Using it, Sky has continued to grow customer relationships in the face of intense online competition. Over the long history of cable television at Comcast, the company has offered television service under broadly the same conditions. Customers pay a monthly fee and get access to one of several large bundles of television channels. Sky followed the same model until mid-2012 when it realized growth had plateaued at just under 10 million subscribers. The company realized just about everyone had Sky satellite that wanted it under the existing model. However, that left 15 million or so homes that either couldn’t or wouldn’t sign up for satellite TV. Sky took the radical step of launching a new online service, called Now TV, with a different value proposition for customers. Instead of big bundles and long-term contracts, Now TV offered genre packages and no commitment. Today, a Now TV user has a variety of options from which to choose. Sports fans can watch all 10 Sky Sports channels for one day for £7.99 or a week for £12.98. They can also buy a mobile monthly pass to 4 Sky sports channels for £5.99 a month. Movie fans can get Sky Cinema for £9.99 a month and parents can buy Kids TV for £3.99 a month. It was a risky step because existing subscribers might choose to cancel satellite subscriptions and instead move to the more flexible Now TV. Comparing Q2 2012, the quarter immediately before Now TV launch, with Q2 2018 might suggest some cannibalization has occurred. Over that period, Sky satellite service lost 0.8 million subscribers finishing with 8.6 million. However, placing all the blame for Sky satellite subscriber losses at Now TV’s door would be too simplistic. 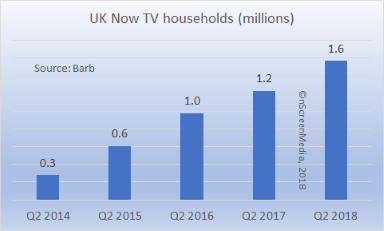 Over the last six years, the UK TV market has become much more competitive. 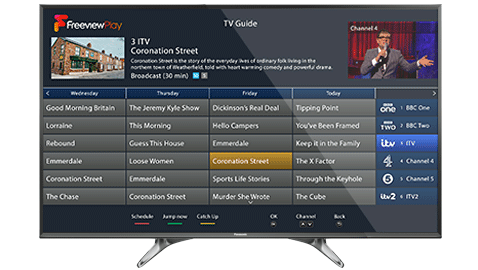 Free over-the-air broadcasters have upped their game with the broadband-plus-broadcast platform Freeview Play. Netflix and Amazon have made huge inroads into the market. Netflix has 9.7 million UK subscribers and Amazon 4.9 million. 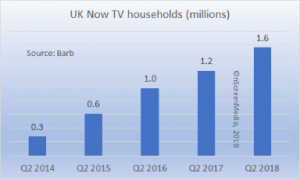 11.6 million UK homes now have a subscription to at least one SVOD service. The truth is that Now TV has allowed Sky to grow customer relationships overall in this hyper-competitive environment. Adding in Now TV with Sky satellite subscribers, customer relationships increased from 9.4 million to 10.2 million. Frankly, this is exactly the approach that Comcast needs right now. In markets where Comcast is available everybody has Xfinity TV that wants it under existing terms. However, there are plenty of other offers on the table from SVOD providers and vMVPDs. These online services are seriously impacting Comcast’s video business. The number of video subscribers has been essentially flat since 2012 and has begun to fall, down 400,000 in the last year. Of course, Comcast may not have the same flexibility with content licenses as Sky has. The company does, nevertheless, have complete control over NBCU content and its regional sports networks. Now TV’s beneficial effect on Sky suggests it is time for Comcast to get a lot more creative with the content it has. Moreover, there may be other TV providers that are willing to come along for the ride. Sky has been able to increase customer relationships in the face of intense online competition in the UK. The credit for the growth goes to the company’s online service Now TV. Now TV offers TV content also available through Sky satellite under different business terms. Comcast should use the same approach in the US where its flagship X1 TV is beginning to fade.